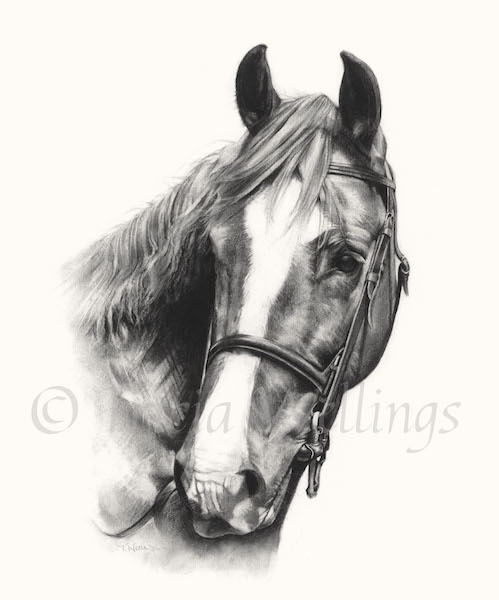 I am a UK-based professional fine artist who creates distinctive drawings and paintings of animals from photographs. The old adage, “It's all in the detail” certainly applies and my goal is to capture not only the physical characteristics, but also the unique personality and "essence" of the animal. I genuinely find with every drawing and painting that it is almost as if a relationship grows and I get to know each animal in a unique way. We become friends and I can honestly say that "I never forget a face". I make sure I work with high quality materials and put my heart and soul into creating a truly emotive and accurate portrait of your animal that you can treasure for many years to come. I am constantly touched by the delighted responses from clients all over the world who have commissioned portraits and consider it an honour every time I am asked to draw a dog, cat, horse, rabbit or any other much loved animal. A portrait in charcoal will provide you with a drawing that conveys lots of emotion. This medium is both strong and dynamic and it will add a more contemporary feel to your portrait. I work on heavyweight ivory white paper, with a focus on the animal only. However, a painting in pastel will suit you if you want to incorporate colour in your portrait, e.g., a pastel painting of your ginger cat will capture those gorgeous marmalade, ochre, lemon and umber hues you love so much! When I work in pastel, I gradually build up many layers of colour to capture depth and tone, with sensitive mark-making to convey the movement and texture of fur. If you subscribe to my newsletter, you will learn about special offers and promotions and the goings-on in my studio. I also feature tutorials and tips for those on their own artistic journeys. I normally respond to all messages within 24 hours, but on occasion this timeline can stretch. Please be patient, I will get back to you as SOON as I can. The General Data Protection Regulation (GDPR) came into UK law on 25th May, 2018. It replaces the 1998 Data Protection Act and introduced new rules on privacy notices, as well as processing and safeguarding personal data. Find out more.